In the vineyards the functionality of the stakes gives stability to the whole row. In order to not make the mechanical operations harder to do, harvesting included, extremely important for the winegrowers it is the material choose so that taking care of the wire fixing to the stake. Some years ago winegrowers used to plant simple canes or small wooden posts. Basically for this purpose, winegrowers used materials made by themselves with poor quality. Today in the market it’s easier to find same products but made mechanically in sawed wood or the whole wooden bit. It is also possible to see some companies which are using small stainless steel pipes coming from wrong supplies. 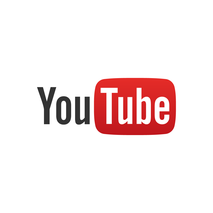 This is a good application, especially to saving extra costs. 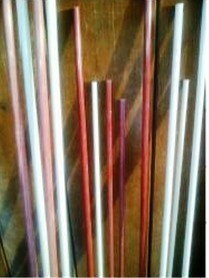 Are also available specific for Vineyards and Profiled stakes made in galvanized iron or in stainless steel or Bamboo. They can be fixed to the main wire by steel hooks, better than the use of thread or different wires. Galvanized Stake Model "Low Cost"
After a long research over the yaers, VIGNATECH can finally offer to its customers the most economc Stake For Vineyards in different length and diamenter. This particolar stake is manufactuer in steel sheet and after a quick process it gets the round form suitable for planting growing. The zinc convering allows to the product an higher life-expecting for the whole vineyard life. This kind of support it is the same used in the construction industry and it can be considered as economic but solid support. Being raw, it could get rusty quickly transmitting it to the wire. The rusty can be eliminated by the use of the same support hot galvanized. Beyond being a vineyard support which allows a correct and vertical planting growing, it must be hard enough to keep under the mechanical operations over the season. Sturdier it is and more protection will offer to the young plants. Thanks to the galvanized process which limits the corrosion, any passage of toxic substances to the plant (and later to the vineyard as well), it is avoided! Pvc stakes are made in plastic material and are used with different length, both from the first wire and to the second wire. Offered more that 35 years old ago, they are pretty easy to be find on the market. 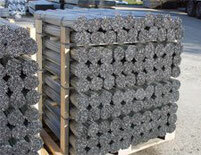 The raw material is excellent, case hardened and able to resist against the weather. 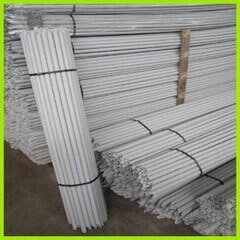 The main benefit of the Pvc stake are a good flexibility, and thanks to their high resistance are able to be efficient over the years. They can be used in different agriculture purposes, such as Tomatoes, Peas, and Bonsai. 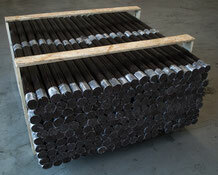 For those who do not want metal or iron stakes, it is available in our lines of produts also the Fiber Glass Stakes. 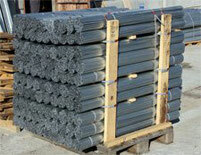 Good strength and durability, They are produces by pultrusion. 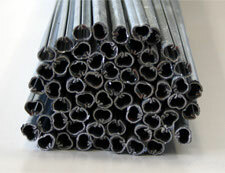 Available in diameters from 6.8-10-12 mm. 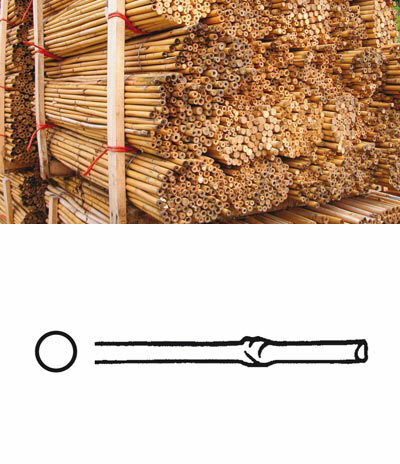 The bamboo Stakes is produced in abundance in several Eastern Countries (China, India, Pakistan, Indonesia, Malaysia, etc..) from which it can be imported already packed in bundles. The work to get the finished product is long and cumbersome and is done by small family businesses, which then give the prepared Stakes to traders and exporters. 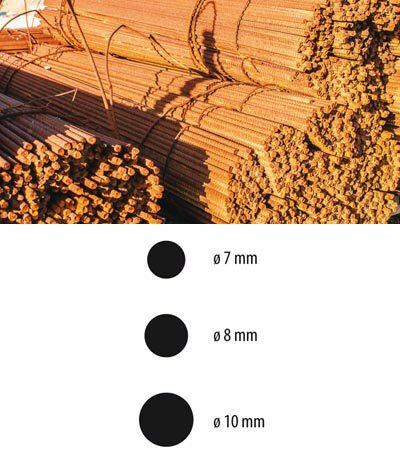 The bamboo culm is mostly full and it is characterized by high strength and elasticity, with a duration depending on the material, from 4-5 up to 7-10 years. The profiles in composite materials made with thermoplastic polymer matrices and reinforcing fibers, obtained thanks to innovative and technologically advanced industrial processes, represent the ideal supporting support for vines, fruit or forest plants that guarantee the correct vertical development thanks to their excellent qualities of durability, resistance and flexibility. The surface finish is specially designed to facilitate the clinging of plants and prevent the risk of injury during use.